The first visitor of the day walks in through the heavy grey doors, a large rucksack on his shoulders. He gives a brief nod and a smile to the invigilator, a student at the university. The visitor peruses the gallery space, first skim-reading the introductory plaque, then moving onto Alfred Drury’s Portrait of Price Edwards (1940s). He observes the mantelpiece of marble, plaster and terracotta statuettes, a display suggestive of Drury’s own in his studio on Gunter Grove. An etching by one of the artist’s teachers, Alphonse Legros, hangs in the top left corner. 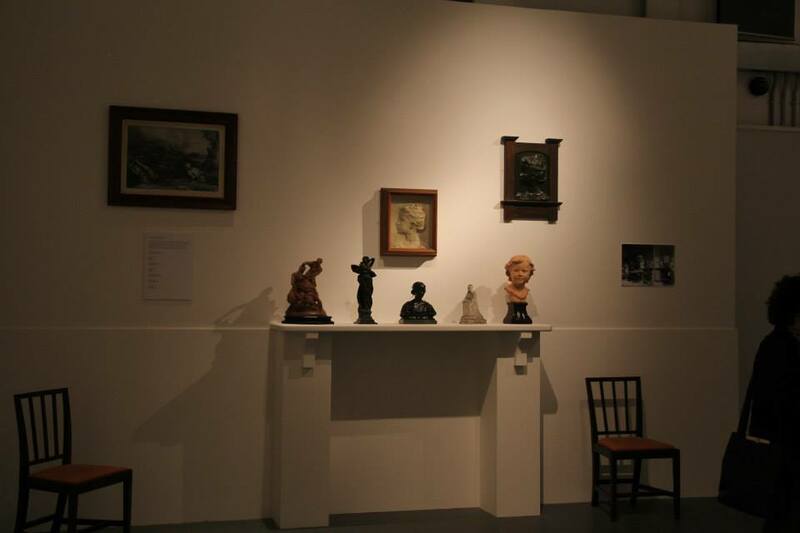 The mantelpiece display based on a photograph of Drury’s studio. Own photograph. The visitor passes through the two glass displays introducing Drury’s best works as a Royal Academician and examples of his New Sculpture movement. 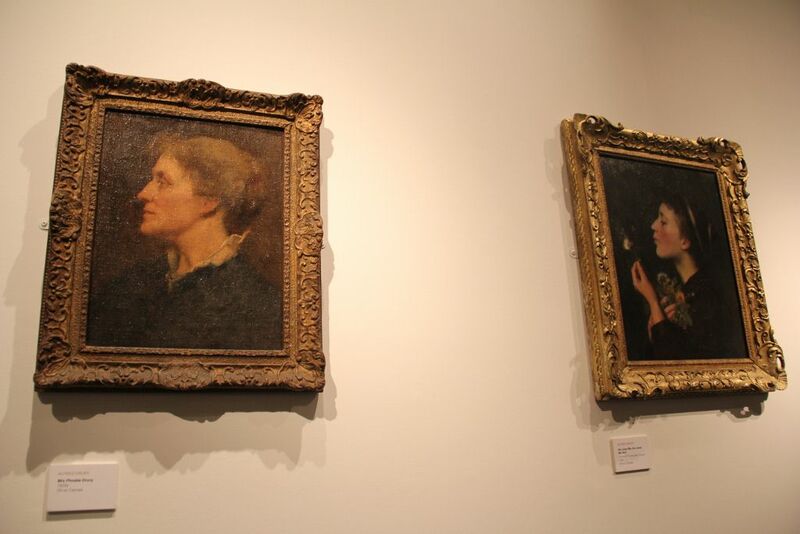 Two intimate portraits of his wife, Phoebe Maud Turner, hang gracefully on the right-hand wall, separated by 30 years of history. A tiny relief of Queen Victoria attempts to dominate the far-too-abundant space around her, while two allegorical bronzes signifying Inspiration and Knowledge (1907) stand side by side on a pedestal, as if in deep conversation. Two portraits of Drury’s wife, Phoebe Maud Turner. Own photograph. 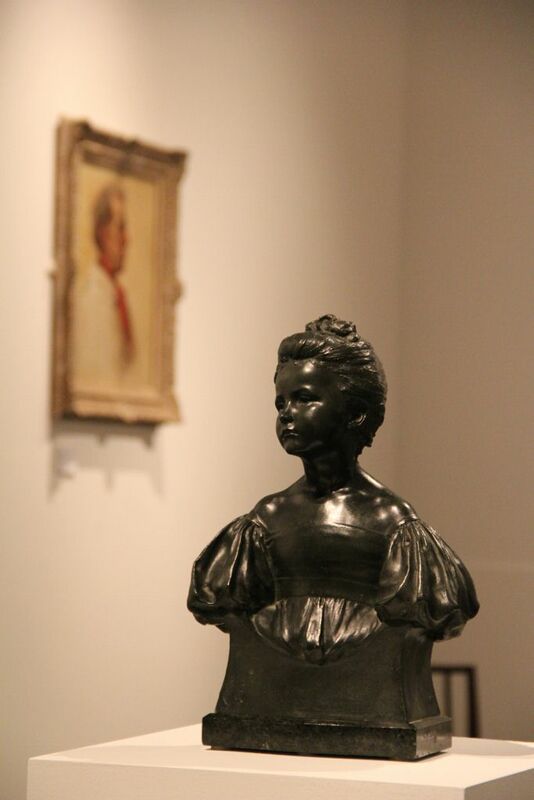 The bust of Griselda seems to make a melancholy, downward glance at Aimé-Jules Dalou’s Head of a Young Man (1876-7) who intentionally looks the other way. Is he Gualtieri, the husband who later divorces her and takes with him her children? His gaze is caught on the visitor who is now admiring Auguste Rodin’s Fallen Caryatid Carrying Her Stone (1880-1). Perhaps he is jealous, his heart consumed by fiery rage. Or is he saddened and sorry for the caryatid, his pensively expressive features admiring the serene forms Rodin had sculpted for her. 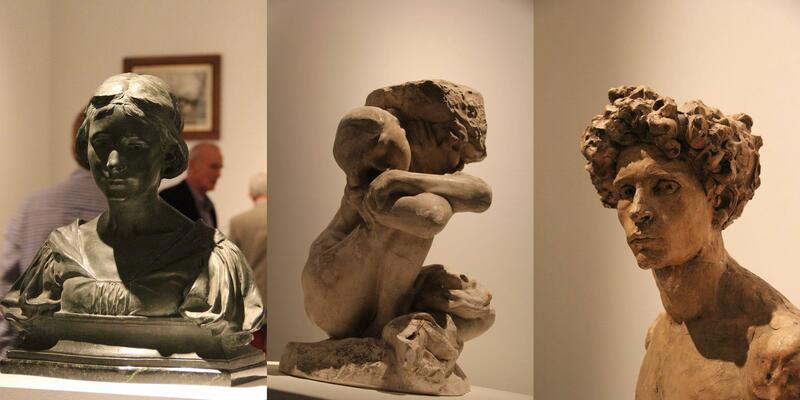 Left to right: Alfred Drury, Griselda, 1896; Auguste Rodin, Fallen Caryatid Carrying Her Stone, 1880-1; Aimé-Jules Dalou, Head of a Young Man, 1876-7. Own photographs. Born in 1856, Alfred Drury was a major figure in the late 19th century New Sculpture Movement, alongside the likes of Goscombe John, Aimé-Jules Dalou, and Alfred Gilbert. This movement focused on the naturalistic qualities of sculpture where, through subtle changes in the medium, the artist was able to convey lifelike human emotions, steering away from the vacant expressions and idealist forms of classical sculpture. Unlike their French contemporaries – e.g. Auguste Rodin – who distanced further away from realism, these British sculptors stood with natural forms to achieve essentially the same goal. The art historian Susan Beattie identifies this movement as being an “outward expression of an inner reality: the world of thought, emotion and imagination”, encapsulated in Drury’s allegorical Spring (1890) and the beautifully intimate Age of Innocence (1897). Alfred Drury, The Age of Innocence, 1897. Own photograph. This new exhibition at the Studio 3 Gallery is a reappraisal of this critically important British sculptor. 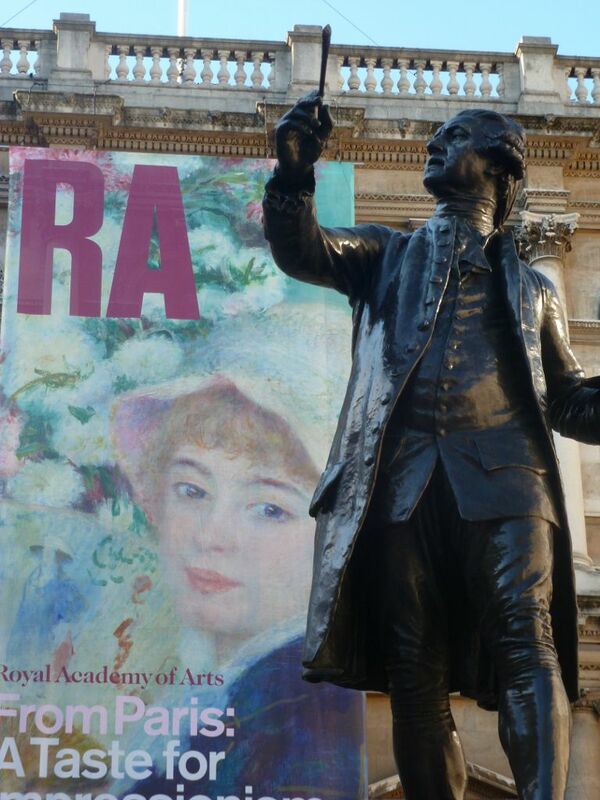 He is particularly known for his public works, notably his sculpture of Sir Joshua Reynolds in the courtyard of the Royal Academy of Arts in London. He is very well-known for his contribution to the façade of the Victoria and Albert Museum’s main entrance, producing the statues of Prince Albert, Queen Victoria and several other ornamental decors. The show, despite feeling rather empty on the walls at times, is a wonderful introduction to the work of this marvellous artist and sculptor. His paintings can feel very Romanticist – Portrait of Price Edwards (1940s) – but in He Loves Me, He Loves Me Not! (1892) a focus on literature and floriography makes it almost Pre-Raphaelitesque. His sculptures, many of which were made for sale – hence ‘domestic sculptures’ – are extremely refined in their portrayal of beauty in the human body while retaining that element of naturalism that makes them so very popular. Heads appear to rest on delicate hands, eyes have an immediate sense of direction, and mouths appear to speak softly in a frozen state of time. This wasn’t just a sculptor who knew how to sculpt. This was an artist who breathed life into his creations, a Pygmalion of the Victorian era. Alfred Drury, Sir Joshua Reynolds, 1931. Own photograph. Alfred Drury and the New Sculpture runs until 20th December 2013 at the Studio 3 Gallery, University of Kent, Canterbury, www.kent.ac.uk; and from 15th January – 13th April 2014 at the Stanley & Audrey Burton Gallery, University of Leeds, www.library.leeds.ac.uk/art-gallery. Next Post ‘England’s Michelangelo’ comes to Canterbury!